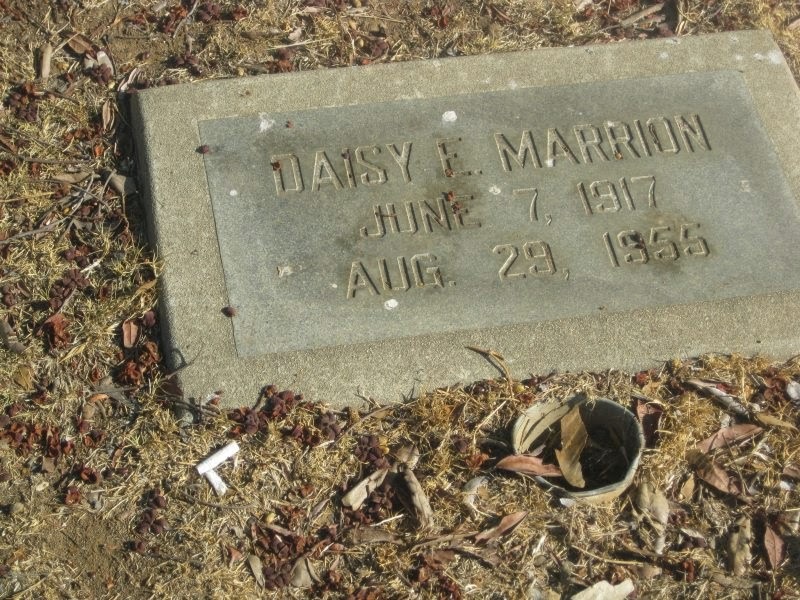 Daisy “Evelyn” Marrion is buried in “Showmen’s Rest,” an area of Los Angeles’ Evergreen Memorial Park and Crematory, among the graves of over 400 former carnival and circus workers. Until I heard about this plot, I never really thought about where circus performers were buried which is alarming since I’m so fascinated by circus and carnival culture. It makes sense that graveyards around the world have special plots for “carnies;” most people are buried with their families and for this particular nomadic population, their fellow circus folk are family. I regret not getting a better photo of Evelyn’s marker. 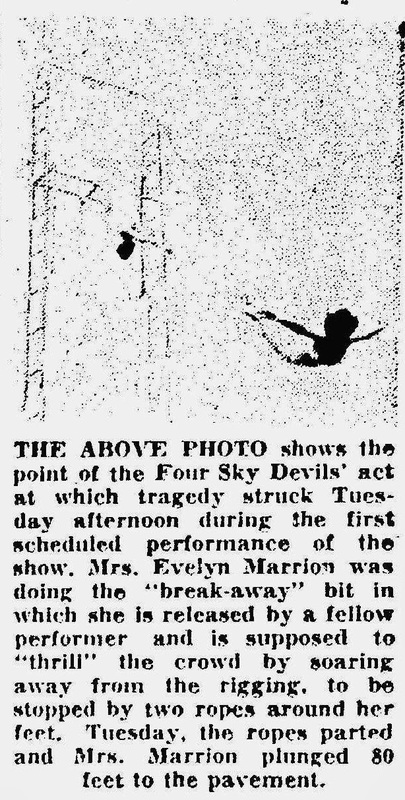 Hundreds of onlookers had gathered at around 4:45 that evening to watch The Four Sky Devils, which at that time included Evelyn, Joe and Shirley Carpini and Jimmy Lloyd. 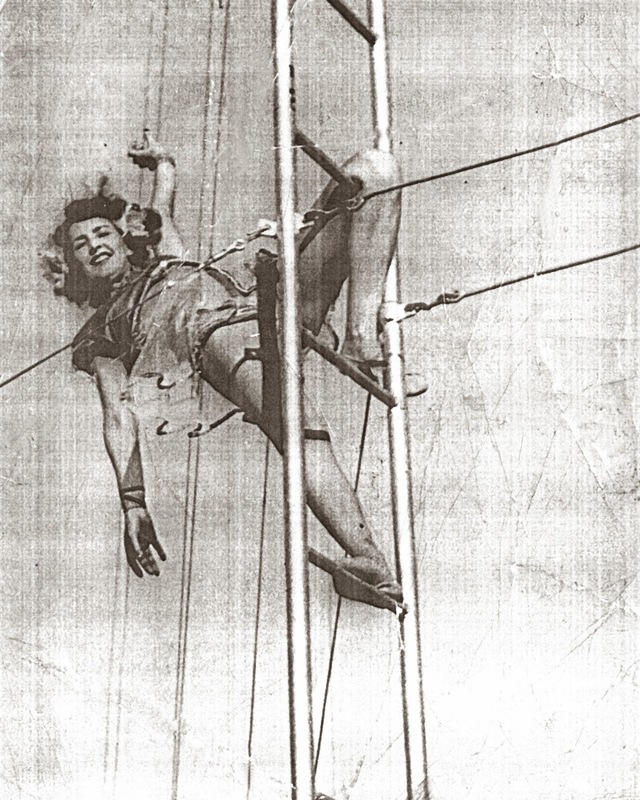 During the breakaway part of the routine, Evelyn was supposed to “fly” away from her partner and out over the crowd, secured by ropes tied at her ankles. The ropes, which had only been used since the end of the previous season and designed to hold 900 pounds, parted and Evelyn plunged 80 feet to the pavement below after first hitting a tree, a trailer, and a wire fence. 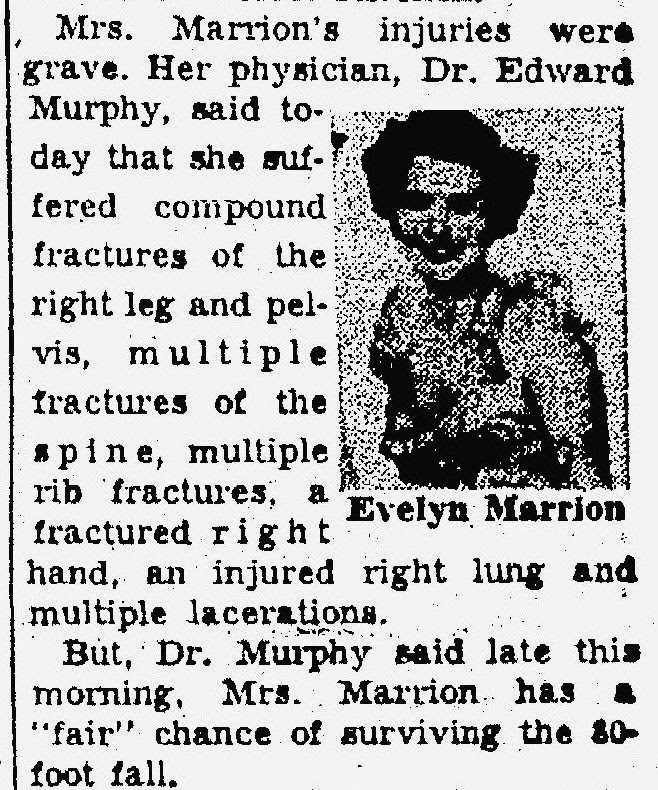 Mrs. Joe Carpini told a reporter that after the accident, Evelyn’s shoe was torn and her “toenails torn away,” but that she didn’t lose consciousness. 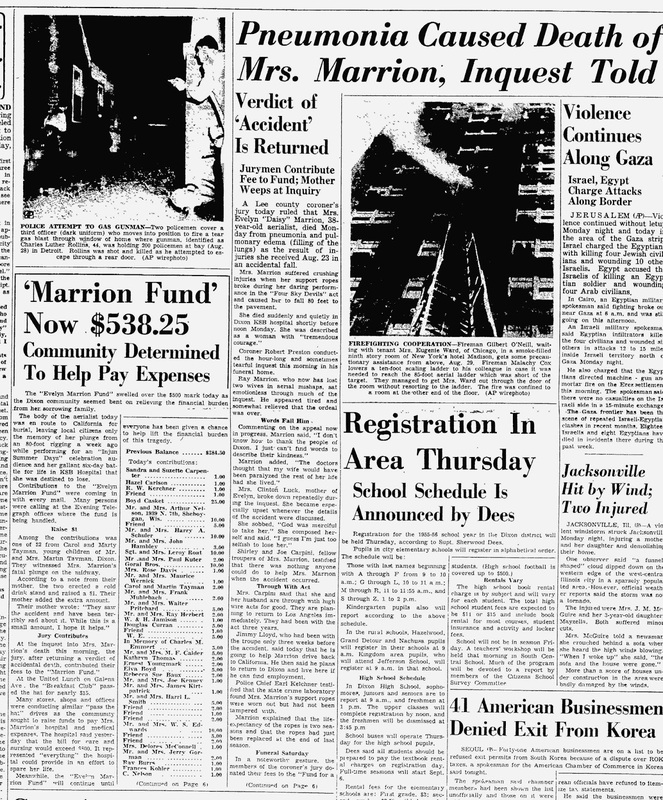 The newspaper described the crowd as “horror stricken” and “too stunned to utter a sound” after the accident, which resulted in a number of serious injuries. Evelyn’s husband Ray (also an aerialist who’d recently taken a job at Douglas Aircraft Plant) was in Los Angeles at the time of the accident. Upon notification he had to be hospitalized briefly for shock, but then caught a flight to Illinois and was at his wife’s side by the next evening. Ray’s first wife died in a similar accident, which I suppose is the risk one takes when going down such a dangerous career path or marrying those who do. In the true spirit of “the show must go on,” Ray took Evelyn’s place in the next afternoon’s act, only in the absence of the breakaway ropes Ray performed a swing act that relied on his neck for support. 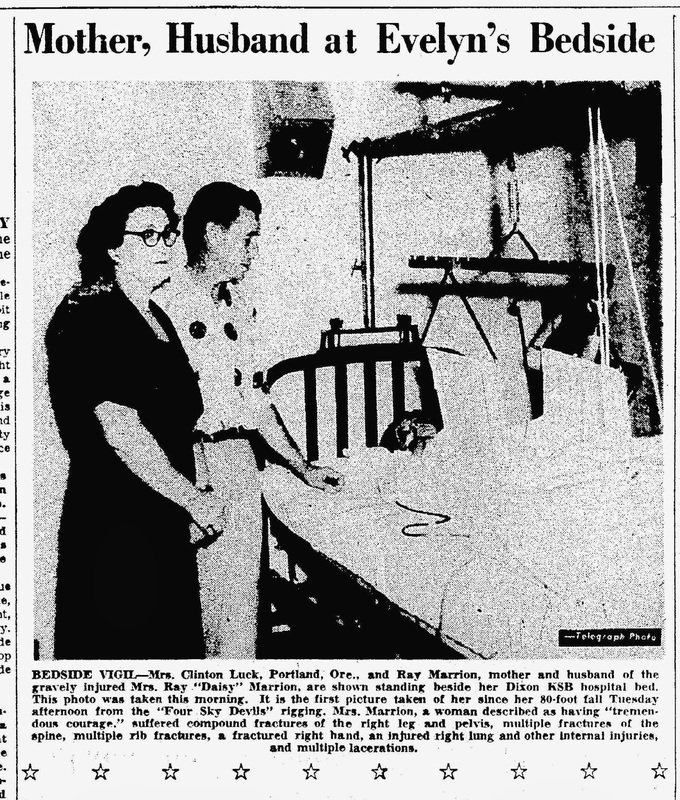 The newspaper printed an image of Evelyn in the hospital on August 26 with Ray and her mother, Mrs. Clinton Luck. (Evelyn’s father, a Portland Salvation Army employee, didn’t accompany his wife and one of his daughters to Illinois.) Articles mentioned a three-year-old named Sheila, who was either Ray and Evelyn’s adopted daughter or the child whom the couple was in the process of adopting*. 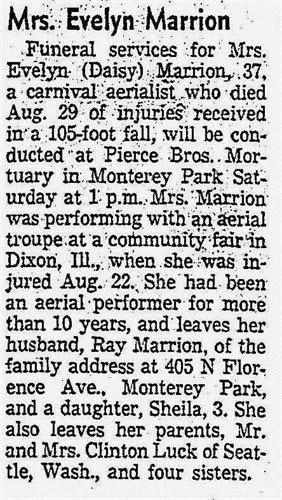 According to the Dixon Telegraph, Shelia was in the audience and saw her mother’s deathly descent. Evelyn’s first husband Gerald Fox died in 1945. She had no other children. After six days, Evelyn died in the Dixon KSB hospital from pneumonia and pulmonary edema. A coroner’s inquest concluded that her death was accidental and that the ropes that pulled apart during the act hadn’t been tampered with. The Dixon community rallied around Evelyn’s family, raising money to pay for her hospital expenses. In fact, the coroner’s jury donated their fees to the fund. Within a few days, the people of Dixon had collected enough to pay the entire medical bill and then send Ray $252.09 to assist with the performer’s funeral costs. One of the articles stated that the payment for each performance at this festival was $100, which seems like such a small amount in comparison to the price Evelyn ultimately paid. The silver lining might be that Evelyn loved her career (something not true for many people) and that she died doing something that she was passionate about.